Exciting, energetic and very funny only partly describe Peter Presto’s children’s magic shows. 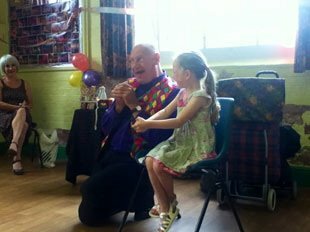 The magic and puppet shows are packed with fun and adaptable for any occasion and venue, whether large or small. The show incorporates magic, comedy, audience participation, and humorous puppets (they look real!). Even the adults love it! Contact Peter Presto for your child's birthday party and for corporate events and weddings. For more information about his acts and services please get in touch. Peter is fully insured and DBS checked. “Dear Peter Presto, thank you for the brilliant entertainment you provided at our daughter’s birthday party. We thought you were wonderful and have already recommended you to our friends! Thank you for making the day enjoyable and memorable." “Dear Peter, I write to thank you for providing the wonderful entertainment at our summer fair. Your show was a great success and attracted a greater audience than we have ever known before! Thanks again." "Dear Peter, the staff at Cotgrave Leisure Centre would like to thank you for the wonderful performance of comedy magic for our children’s Christmas party. Both the staff and children were thoroughly entertained!" “Dear Mr. Presto, thank you so much for the brilliant magic show you entertained us with yesterday. Joshua and Esther have not stopped talking about you today! We loved the Racoon and the Mouse." “Hello Peter, thanks for the excellent performance yesterday at Rufford Park. We counted over 400 people!"